Joe McHugh – the Fine Gael candidate has been elected in Donegal North East. Martin Ferris – who was elected to Kerry North-West Limerick for Sinn Féin. Arthur Spring – who has taken a seat in Kerry North-West Limerick for Labour. Tom Barry – who was elected on the seventh count in Cork East for Fine Gael. Sandra McLellan – the Sinn Féin candidates was also elected in Cork East. Eoghan Murphy - who was elected in Dublin South East for Fine Gael. Peadar Tóibín – who was elected in Meath West for Sinn Féin. Eric Byrne – who took a seat in Dublin South Central for Labour. 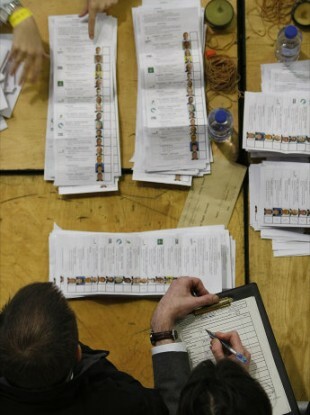 Pat Breen – the Fine Gael candidate has taken a seat in Clare, on the 11th count. Michael McNamara – who has been elected for Labour in Clare. Jim Daly – who was elected for Fine Gael in Cork South West. Maureen O’Sullivan – who, as an Independent candidate, has taken a seat in Dublin Central. Kevin Humphreys – who beat Fianna Fáil’s Chris Andrews to take the fourth and final Dublin South East seat for the Labour Party. Dan Boyle – the Green Party candidate has been eliminated in Cork South Central. A good night’s sleep – for people closely following (or involved in) the count, as it rolls over into Sunday morning in over a dozen constituencies. Email “The Half Hour Fix: 1.30am”. Feedback on “The Half Hour Fix: 1.30am”.